Use this super simple DIY to freshen your room and linens for spring! Whoohoo, we've officially made it to spring! All of our leaves are back on the trees and the flowers are blooming down here. So are my allergies. But a runny nose and itchy eyes aren't going to stop me from enjoying the the last few weeks before it's absolutely miserably hot here! I'm going to enjoy this season while I can. Hashtag Texasprobz, for real. Anyway, I've crafted up a really easy, really fresh smelling room spray for you so that you can enjoy your spring to the fullest, too. 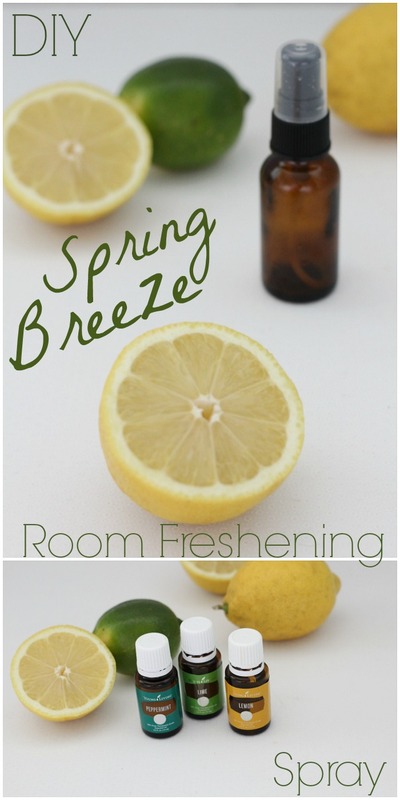 The key to this spring breeze room spray is the lime, hands down. Yes, lemon is a fresh scent that reminds just about everyone of what "clean" smells like. Yes, the peppermint cools down the citrus tones. But the lime? That is what really makes it smell like spring! Which is funny because I don't associate limes with spring necessarily, but I'm telling you - it's spring in a dang bottle. And it's strange because if you smell the lime essential oil right out of the bottle, you wont think spring immediately. It's when the oil is diffuesed or sprayed that makes me (and others who have walked into my home) go, "ohhhh, that smells so good, what is that?" It's lime, that's what it is. Who knew right?! Well, now you do, so that makes two of us. - 2 or 3oz glass bottle. I really like these because the spray pump goes all the way to the bottom, so you don't waste a drop of anything you put in them! Put the salt in the bottom of the glass bottle. Then add your essential oils. Put the lid on and give it a good shake, distributing the oils amongst the salts. This step is important because if you think back to grade school science class, you'll remember that water and oils don't mix. So you want to put the oil on the salt and let it absorb so that they'll be distributed in the water evenly, and the spray will smell the same each time you use it. Ok, so after you've shaken the oils and salts together, fill the glass jar up with the water. Shake again and spray the spring breeze everywhere! Just remember to give it a little shake before you spray it each time so that the salts and oils get mixed back in with those water molecules. Your house, your linens, your towels - whatever you'd like will smell fresh and spring-y! Uh, yes please! Citrus is my JAM year 'round. Hey! Next can you make wax melts?? I just got a few citrus-y EOs! Going to try this mixture. This also would be a great flavor combo for a cocktail. Just saying. I love essential oils. I have never thought to combine those 3 together. definitely trying it soon. Using essential oils is always my go to for freshing up pillows, linens, couch just anything. You really made the instructions easy to follow. Great post! I love essential oils.Great post! This sounds like it smells amazing! I love citrus scents. Especially lemon and orange. Thanks so much for sharing this. :) This has to be better then some of the aerosol stuff out there. This sounds so yummy smelling!! I need to break out my essential oils. Thanks for sharing! I really need to get some lime EO asap! I've been diffusing peppermint and lemon a lot lately! Such a great trio for a refreshing spray! I am so making this room freshener. I have all the ingredients readily available.